Step 1: Log into your SWA Ultimate Library and change your Password (especially if someone else registered your SWA Account for you). Step 2a: Download 5 ebooks that you like, and quickly skim through those ebooks. Step 2b: Edit your Profile and enter your correct Payout Details. Step 2b-1: Click the DownArrow. Step 2b-2: Choose where you want your Payout sent. Step 2b-4: Click the green SAVE button. Step 2c: Learn "How To Request For Your SWA Ultimate Commission Payouts"
Step 3: Read at least three (3) pages from "The Game of Life" ebook every week. Step 6: Add useful or entertaining stories to your blog (around once per week), and let your friends in Facebook know about this by publishing a link to your latest blog post once a week on your Facebook wall or timeline. Step 8: Join Team Manny Viloria to get access to Special PREMIUM tips inside the Private TMV Group in Facebook. Enter your Name and Email Address on the form on the right, and get tips/updates and info on how to join Team Manny Viloria (delivered straight to your email Inbox). How to Turn Your $20 SWA Commission Into $574... REVEALED! When Is The Most EFFECTIVE Time To Post In Facebook? How Often Should You Blog And What Should You Do After? Its nice that i join the swa… more info needed. Hi Sir Manny..thanks a lot for sharing your tips and knowledge.More blessings to come for the year 2014.Godbless.. Thank you so much Sir Manny kahit hindi tayo mag ka TEAM sa Supreme Wealth Alliance madami pa din ako natutunan sa mga blog mo at mga post mo..
Sir Manny ; thank you very much for ur link …i really want to learn and earn. God bless…. [From Manny] God bless you and your family, Jean. sir. Manny gud am po! help me to start in the SWA business po wala pa po nag referal sa akin. hello bro..Manny kmusta?well mayroon sana akong matanong kung cno ba ang unang referral mo sa swa ay doon ka rin bang makipag coordinate?dahil si Rommel Aguas ang aking unang referral i mean siya ang nagbigay nang ACTIVATION CODE but sa main office me nag deposit thru western union..well bro..anyhow we are all united in SWAmazing and thats we call AMBASSADOR OF GOODWILL thank you bro..manny for your kind moral support to every swamily members more power and Godbless us all..
[From Manny] Hi, Bro. Rolando! 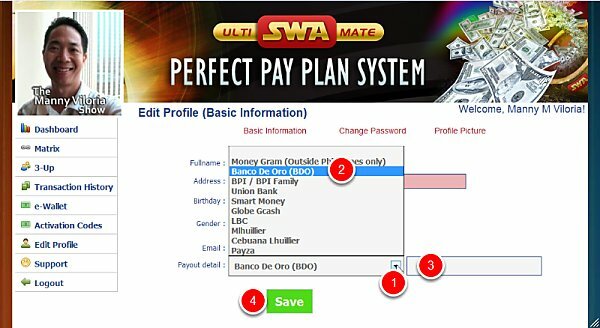 🙂 Kung individual po ang pinadalhan ninyo ng Western Union remittance (kasi bumili po kayo ng Activation Code), makipag-coordinate po kayo sa taong yun. Kung ang official SWA Philippines, Inc. recipient naman po ang pinadalhan ninyo ng inyong bayad, please coordinate with the person who told you about SWA. God bless you and your family, Bro. Rolando..